QIAO NEXT INTERACTIVE DIGITAL BUSINESS is our Digital Division to help you to increase your ROI and maximize your brand awareness on China market and abroad. Around a global strategy, we combine traditional and innovating marketing, locals and international channels and media, digital and interactive actions. A teamwork in our local offices to create results on the target markets. Combining creativity and innovation with results, we create and manage for our clients B2B & B2C platforms and infrastructures as concrete support for their commercial, distribution and trading activities (catalog, payments, logistics, customer care) directly in China. First Cross-Media Network for China Market. Over 500 Million of potential targets are on your fingertips!! My China Media Network is your answer. Your Customized Media Service to find the right Channel in China. - China: "China Media LAB" in Shanghai at Italian Center. - Italy: Consorzio DITE (Milan). 1) Fill out the My China Media Network Form. 2) Your My China Business Personal Assistant will contact you for next steps and quote your required service. 2019，the cheery Pig New Year hold lots of happiness for you! FRENCH novelist Jules Verne's dream to travel the world in 80 days is no big deal in today's world of fast transport. But adventurer Louis Palmer is taking a page out of Verne's book by attempting to travel the world in 80 days in emission-free vehicles. Setting off in Geneva, Switzerland, on August 16, the 39-year-old Swiss and his team arrived in Shanghai yesterday. Thus far, the journey has taken them 16,000 kilometers in 46 days with stops in 16 countries, including Germany, Austria, Russia and Kazakhstan. Next stop: Vancouver, Canada. "We want to show that electric mobility and renewable energies can provide a new solution for an ecologically balanced life on this planet," Palmer said. "This trip can let more people know that emission-free vehicles are possible and reliable. We drive for a greener future. Experts are calling for more cooperation between China and other nations in developing carbon capture and storage (CCS) technologies as institutions from the United Kingdom prepare to announce at the Shanghai Expo the launch of a UK CCS research facility. The University of Nottingham told Xinhua on Tuesday it would announce the launch of the UK National Center for Carbon Capture and Storage (NCCCS) with the British Geological Survey at the London ZED pavilion on Oct 11. Electric cars could benefit from a new manufacturing method. A new chemical trick for making nanostructured materials could help increase the range and reliability of electric cars and lead to better batteries that could help stabilize the power grid. Researchers at the Pacific Northwest National Laboratory (PNNL) in Richland, WA, have developed the technique, which can turn a potential electrode material that cannot normally store electricity into one that stores more energy than similar battery materials already on the market. In work published in the journal Nano Letters, the PNNL researchers show that paraffin wax and oleic acid encourages the growth of platelike nanostructures of lithium-manganese phosphate. These "nanoplates" are small and thin, allowing electrons and ions (atoms or molecules with a positive or negative charge) to move in and out of them easily. This turns the material--which ordinarily doesn't work as a battery material because of its very poor conductivity--into one that stores large amounts of electricity. The Boeing Company has unveiled the hydrogen-powered Phantom Eye unmanned airborne system for collecting data and communications, a demonstrator that will stay aloft at 65,000 feet for up to four days. Phantom Eye is powered by two 2.3-liter, four-cylinder engines that provide 150 horsepower each. It has a 150-foot wingspan, will cruise at approximately 150 knots, and can carry up to a 450-pound payload. 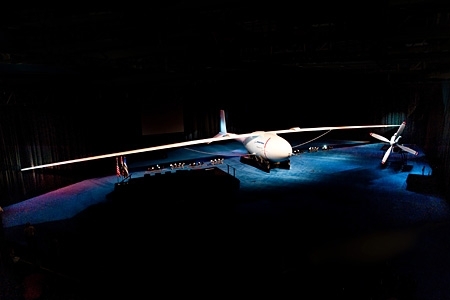 Later this summer, Phantom Eye will be shipped to NASA’s Dryden Flight Research Center at Edwards Air Force Base, Calif., to begin a series of ground and taxi tests in preparation for its first flight in early 2011. That debut flight is expected to last between four and eight hours. Qiao Lab Next Business (Shanghai) Co., Ltd.